Is U.S. democracy in decline – and is the upholding of parts of Arizona Law SP 1070 by the Supreme Court further proof of this? 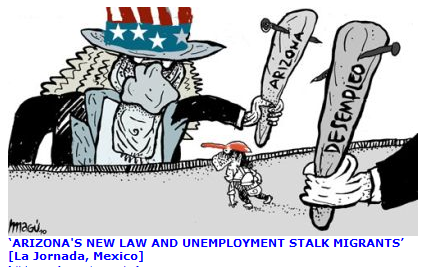 For Mexico’s La Jornada, columnist Claudio Lomnitz warns his readers that they and their government must be ‘vocal and truthful’ with Washington about the consequences of the expanding ‘plutocracy’ in the United States, which increasingly demonstrates its disdain – no only for foreigners and immigrants – but for average U.S. citizens as well. Nobel Laureate in Economics Joseph Stiglitz recently wrote that the United States is rapidly ceasing to be “the land of opportunity.” Increasingly, opportunity is inherited. The system rewards financial speculation over work: on average, engineers, inventors, designers, technologists, doctors, artists and scientists earn only a fraction of what a brat from the financial sector receives, although his contribution to the economy is to sink one company or another or embezzle the funds of pensioners. Politically, this rise in inequality is creating a system that resembles a plutocracy. The right has a Supreme Court majority, and in electoral terms, this has resulted in reforms of the electoral laws that allow corporations to operate as if they were people. This gives huge advantages to candidates who enjoy corporate support, as was seen during the recent Republican primaries, in which a candidate, although more sane and presentable than his opponents, was also much less popular. we must understand that there is a close relationship between abusing the human rights of foreigners and the ongoing domestic process of social exclusion must be understood. The legalization of torture at Guantanamo was, in that sense, a major defeat for the entire U.S. population, since support for such an extreme measure helped justify the loss of domestic guarantees, the hardening of criminalization and the proliferation of prisons and migrant detention centers. To all this must be added this most recent decision, which means that Arizona police now have a new tool with which to oppress the entire population with a Latino appearance, whether they are citizens or not.